In a world populated by human-like animals, a koala named Buster Moon (voiced by Matthew McConaughey) runs a beloved, once-grand theater, that has fallen on hard times. 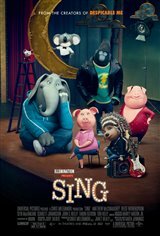 With the help of his sheep friend Eddie (John C. Reilly), Buster decides to raise money to keep the theater from being shut down, and holds the world's greatest singing competition. He distributes flyers far and wide, and a large number of singing hopefuls dream of winning, including unappreciated stay-at-home mother pig Rosita (Reese Witherspoon), a gorilla named Johnny (Taron Egerton) who doesn't want to follow his father's criminal footsteps, and a shy young elephant named Meena (Tori Kelly), whose biggest fan is her grandpa.